This international competition challenged entrants to develop a concept for a new urban village that provides a variety of housing options and lifestyle choices based on sustainability, innovation and a strong sense of community. 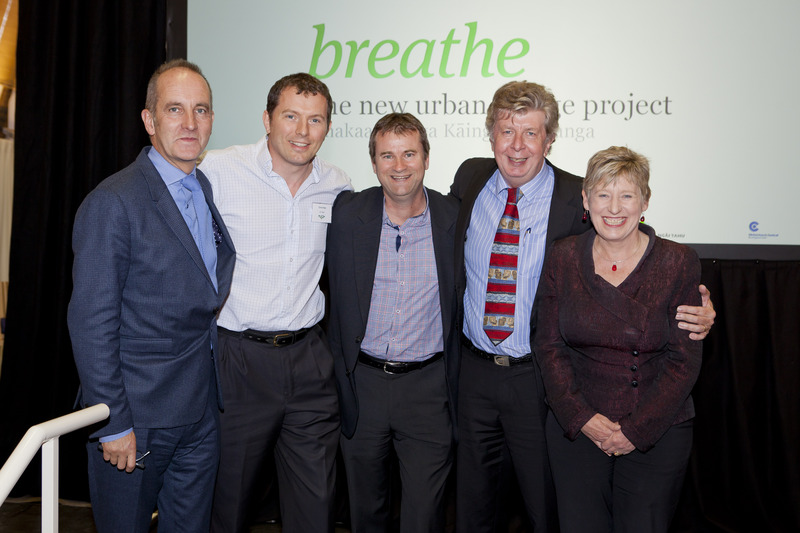 On 22 October 2013, the winning team in the breathe international competition was announced at the Christchurch Cardboard Cathedral. New Zealand Steel sponsored the competition and Chris Kay and Franz van der Velden were in attendance where they met up with two of the judges, Kevin McCloud and Di Lucas. New Zealand Steel has an association with Kevin McCloud through their sponsorship of Grand Designs on NZ television. Kevin had visited Christchurch to witness the extent of the earthquake damage in October 2011 when he was in New Zealand for the COLORSTEEL® sponsored - An evening with Kevin McCloud. The competition challenged entrants to develop a concept for medium density living - a new urban village that provides a variety of housing options and lifestyle choices based on sustainability, innovation and a strong sense of community. Architects had three months to create a concept in three drawings that would change the way people think about urban living, by designing an exemplar housing development that would be the catalyst for modern urban living in the heart of the city, and attract a new and diverse residential community back into the Central City. From 58 entries from 15 countries, the judges identified four finalists who had three months to take their initial concepts through to a more developed design. Building and Construction Minister, Hon. Maurice Williamson officially announced the winners as the Holloway Team, led by Holloway Builders from Christchurch in partnership with architecture firm Anselmi Attiani Associated Architects and Cresco engineers, both from Italy. The winning concept will be built adjacent to Latimer Square, offering its residents an exceptional quality of life, with local parks, entertainment, recreational facilities, and the central business area nearby.